Hello Linux Geeksters. As you may know, PostInstallerF is an open-source tool that helps the users to easily install open-source drivers, codecs, add repositories and popular free and third party software like Steam, Skype, via a simple and intuitive GUI. The latest version available is PostInstallerF 1.5, which has been released a while ago. This software is very useful for installing your favorite apps on freshly released systems, like Ubuntu 15.04 and Debian 8, released last week. 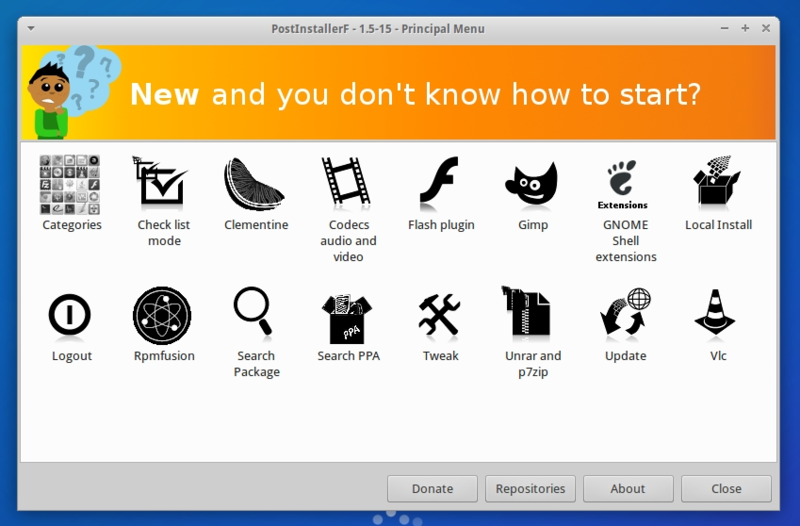 In this article I will show you how to install PostInstallerF 1.5 on Ubuntu 15.04 Vivid Vervet, Ubuntu 14.10 Utopic Unicorn, Ubuntu 14.04 Trusty Tahr, Linux Mint 17.1 Rebecca, Pinguy OS 14.04, Elementary OS 0.3 Freya, Deepin 2014, Peppermint Five, LXLE 14.04, Linux Lite 2, Debian 8.0 Jessie and other Ubuntu and Debian derivative systems. Because it is not available via any repository or PPA, we have to download the needed packages from the project’s sourceforge page and install it via command-line. Also, the WebUpd8 PPA is needed for yad. I prefer gdebi over dpkg due to the fact that it also handles dependencies.